Newsgur USA: Does Trump dream with Putin daily? 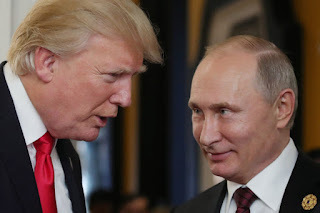 Does Trump dream with Putin daily? Donald Trump must dream on Putin daily. Since he seized the power Russia has been a constant topic on his agenda. It is not enough with the supposed collusion in 2016 election, Syria, North Korea and Ukraine; now Russian hackers are a nightmare to his government and the intelligence services. Moscow is accused of cyber-assaults in US energy network distributing the NotPetya malware and ransomware because the same malware has been found in several American energy companies like nuclear, water and “critical manufacturing” sector. According to experts, the malware has been traced back to Moscow. Former security officials of US believe Russia is causing troubles to American security and they are trying to control it. Ironically and despite Cybercommand, NSA, Homeland security, and other agencies reinforce their protection and their technologies, Russian hackers still gain illegal access to American main infrastructure and political institution. The FBI and the Department of Homeland Security are working and alerted about the malware and called for a review of their security systems. A report of Intelligence agencies concluded cyber-attacks in US infrastructure began in March 2016. That assertion added to Donald Trump’s warning about Russia’s interference on domestic affairs to undermining the status quo of the nation and dodge the attention to Russia’s human rights violation’s cases like Georgia and Ukraine, as well as its soften standing regarding North Korea. Although not substantial evidence has been found yet, it seems the Kremlin is guilty of all that happens in the West in the latest months. Moscow is the new threat, Isis is almost a vanished smoke and their attacks lost weight in headlines. Even if Isis kidnaps Donald Trump and claims the act and still, Europe and US will say that Russia colluded to do so. A DHS former officer said that energy sector was a target since a long time ago of Russian government’s cyber-hackers. Several analyzers and members of the Senate and intelligence committee consider the previous is part of Russia’s interference on 2016 election that touched every sector on US. Many sources agreed that this time the attack was another way to gather initial information about how the energy network runs. According to Homeland Security and FBI, America has been under multi cyber-attacks that finished the campaign. The report points out hackers with commercial targets that introduced malware to obtain remote access in energy grid sector. Adam Schiff, the top Democrat on the House intelligence committee, said Russia’s attack was carried out on American soil. Therefore, they, as a nation, should respond with stronger restrictions to stop Moscow’s escalating aggression that included, recently, chemical weapons’ attack in Britain. The first actions in this direction were announced by US treasury. They sanctioned individuals and entities like FSB and GRU intelligence agencies, as well as the Internet Research Agency in St Petersburg although no evidence was found. US sanctions went to six senior officers of the military intelligence service, the GRU including its chief, Igor Korobov, and three of his deputies. Also, 19 individuals involved in the cyber-attacks have been condemned. The punitive measure is part of US reply to Moscow’s supposedly attacks and interference on election. Thought US energy grid was attacked and the reason why are already know what remains a mystery its dimension, the purposes to gather info and what it will come next. In theory, cyber-actors pretended to control industrial energy systems.